Lord, Bless the wives who grieve alone and comfort the mothers who mourn their own. Give solace to the fathers who lost their sons on foreign shores and in places unknown. Lord Strengthen the resolve of we who remain to see that they did not die in vain. Amen. For they've been away so long. Bless those who await their safe return and those who mourn the lost. God, bless America and her heroes…and thank You for the privilege to serve. Amen. 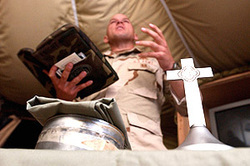 Most gracious Heavenly Father, thank You for the men and women of our armed forces. Protect them as they protect us, defend them as they defend us. Encourage and strengthen their spirit, soul and body in the execution of their duties and responsibilities. May they be mentally and physically strong as they face the challenges of combat. Under gird them with Your spirit and might when they are called upon to to endure the hardships of battle. Thank You, Lord, for providing America with the best trained, equipped and lead military force in the world today. Fill them with Your saving grace, and the gospel of peace that they may be shining examples of Your love. In Your precious name we pray. Amen. Dear God, as we approach Memorial Day, may we honor and remember those who died that we might live in freedom. We remember our departed loved ones gone on before. This that we honor will be a part of our lives forever. O God, we are mindful of your great love for us. We are thankful for that love. We praise you for the blessings of love and friendship, for our families and our homes. Amen. Lord, be with us and be our guide in time of need. We ask your support in all we do. Help us to reach out to one another, to communicate and show real care for others. Help us to be open to new experiences of personal growth and challenge. May we be alert to the opportunities before us each day. Accept our thanks, Lord, for the leaders of our (Auxiliary) (American Legion), for their work this year, and for their leadership. As they have worked for God and Country we give them our grateful thanks. Amen. May you, our members bring joy and happiness to others through your smile, a warm hand clasp and kindly deeds. Be with us today and give us hope. Amen. any man's death diminishes me, because I am involved in mankind, and therefore never send to know for who the bell tolls; it tolls for thee.